Today was John Lawson's funeral service in church. My own feeling was that there could not have been a more full and fitting celebration of John's life, faith and work. It was a privilege to lead. Being a writer and all-round opinionated bore, words don’t often fail me, but I’m finding it extremely hard to describe how I feel this morning. Last Friday night, my father passed away after what we are, I suppose, obliged to refer to as “a long battle with cancer”. He slipped away in the night, at home and in bed with my mum (just as it should be), and he leaves a yawning chasm behind, not just for me but for my entire family and anyone who ever knew him. I know almost everyone thinks that their parents are infallible, but my dad really was a wonderful human being. He was a kind, generous, gentle and fiercely intelligent man who never knowingly said or did anything that caused pain or sadness to another living being. Most remarkable of all, he seldom spoke unless he had something to say. God knows, the world could use a few more people like that. In some respects I didn’t have a huge amount in common with my dad. I didn’t share his religious faith, his political views, his taste in music or his calamitous dress sense, but those things are utterly trivial when you love someone as much I loved him. The important thing is that I always knew that my dad loved me and was proud of me, despite my many faults, and that he knew that I felt the same way towards him. And I admired him immensely. I’m lucky enough to do what I love for a living, and my dad was the same. An insanely talented artist, he designed stained glass windows for a living and leaves behind an astonishing legacy of beautiful creations that, with luck, will survive for many hundreds of years. I can only hope that I will be able to make such a lasting and worthwhile mark on the world. I also hope that I can become a little bit more like my dad along the way. I miss him terribly and will carry his memory in my heart forever, as will my mum and my two sisters, Rebecca and Helena. We all love you, Dad. It seems most appropriate that we gather together to give thanks to God for John today - Remembrance Day. Remembrance Day is a day filled with many memories for generations of people and over-flowing with a hope that events past should not be repeated. Today is also a remembrance day for the Lawson family and so many others of us, as we give thanks to God for John, treasuring many memories. But our remembrance of John today must also be a day over-flowing with hope because of the faith in God which was John’s quiet and sure centre. I first met John as I moved to be Vicar of Leverstock Green nearly 6 years ago. I have to be honest that it took me some time to begin to get to know him. He was always faithfully here, but we didn’t do chit chat. But what I did quickly discover was that whilst John didn’t say much about his faith, it could almost tangibly be felt flowing from him. John was a man of few well chosen words, and this man of few words lived out a quiet but sure faith, and he would not want to be centre of attention today, yet this church with so many many others shout aloud about his life and his faith. John’s faith journey begins at at St. Saviours church, St. Albans as a boy, becoming a server as a teenager and marrying there as a young man before moving to worship at Holy Trinity when his first child arrived. John’s quiet faith was lived out as he served God over the next 40+ years at HT - as a Server, Reader, Sacristan, Sidesman, Chalice Assistant, all done with the quiet dignity and lack of fuss that was needed and was just John. Where John did publicly express his faith was in his art, and what a God-given gift John had! In this church some of the kneelers, the altar rails, the Stations of the Cross, the tea-towels, notelets and the window in the Benedict Chapel are all John’s handiwork. 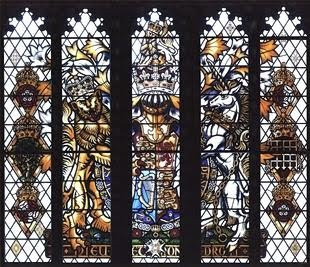 But John expressed his faith, especially in stained glass in windows in many churches as diverse as Elmore and Westminster Abbies. It was in glass that we saw something of the depth, colour, shape, beauty and yet simplicity of John’s faith. Describing John, I would feels like I do him a disservice when I say what so many others have - he was 'a lovely gentle man' yet his quietly held faith centred on the love of God was a hallmark of his life - the characteristics of that love were described so beautifully by St Paul in the reading Martin will read for us later. Whilst John’s faith was a personal & private thing to him it was a wellspring of resources for him throughout his life. John was involved in planning the content of this funeral service and in the light of this his family wish to remember John by letting the music, art and words speak, not just of him, but of the God who gave purpose, direction and meaning to his life. The Word as a Wordle... with a difference!